This week we take a look at the science behind designing a good draft beer system for your kegged homebrew. Everyone loves draft beer, and I consider my keg system to be one of the best purchases I’ve made in my brewing career. Kegging makes everything easier, and if you want to start kegging, please read my earlier article on how to keg. This week we’re going to look at the more advanced topic of balancing your keg lines. In my previous article we covered how the temperature of the beer and carbonation level desired in volumes of CO2 drives the overall carbonation pressure – a number you can also calculate easily using BeerSmith. You will need to know your keg pressure as a starting point for designing your overall system. However this is not the complete story – as the lines of your keg play a very important role. In general the longer your keg lines are, the lower the serving pressure at the tap. If the tap pressure is too high or too low, the overall system is said to be out of balance and your beer will either foam or be flat. Using the above equations, it is pretty easy to calculate the ideal line lengths for a given keg system operating at pressure. Hopefully this will help you properly balance your own keg system for home use. I intend to roll the line length calculator into a future update for BeerSmith. I hope you enjoyed this short article on balancing your kegging system. Thank you for joining me on the BeerSmith blog – and please subscribe to my newsletter or give my home brewing software a spin for some great ways to improve your homebrewing. That sounds like a lot of pressure – probably too much for that temperature. You would need to balance the keg line with the keg pressure – do a quick search for “keg line balancing” and I think you’ll find my article on this. I read the article, and replaced my keggerator lines with three and a half feet of 3/16 id tubing, but still get foaming at the front of the pour, I have flow control faucets and am serving at 10 psi. I previously had a two foot run and had the same issue. After the two foot run, I tried a five foot length and poured nothing but foam, so I switched to a shorter run. As it stands now, I can see co2 rising in the line up to the tower so I’m assuming thats where the foaming is an issue. How can I prevent that? Is it a pressure issue? I am a draft installer And refrigeration guy. 1 thing you guys are missing. It’s all about the relationship of temperature and pressure. Higher the temp the more restriction and subsequent pressure u need. Altitude also plays a big role. Look up the Denver effect – coors brewing discovered that when they took their rocky mtn beers and pressure requirements down from the mountains. They use 9′ on straight Co2. At lower elevations, their beer turned to whipped cream. Ok- soda water is different from beer, but Co2 will only stay dissolved in a liquid substrate if the pressure and temp are in balance. As the product rises above 38f, the Co2 molecules expand in size and exert greater internal keg pressure. Applied pressure must exceed the natural internal keg pressure and again, depends on temp. And also volumes of Co2 dissolved in your particular beer, which varies if brewed properly by style.. I do this every day and there is much dispute over the restriction value of 3/16″id vinyl or PVC tubing. It used to be 3psi/ft, now many argue it’s 2.2psi/ft. Neither seems to work and when I press the suppliers, no one knows where the values come from because the tubing manufacturers don’t test it for restriction. 1/4″ is .8/ft – 5/16″ is .4 – 3/8″ is .2 for vinyl… poly tubing 1/4″ is .6 – 5/16″ is .2 – 3/8″ is .07/ft…. barrier tubing is as follows – 3/16″ = 2.0/ ft – 1/4″ is .3/ft – 5/16″ is.1/ft – 3/8″ is .06/ ft …. Generally 1/2″id across all variations is considered o.o/ft and is for running a distance of up to 500′ (Stadiums, venues, large ships, etc) Guys, I used to brew when I wasn’t working 100+ hours a week running my business, so I’ve done all aspects + draft technician at a Guinness distributor for 20+ years. Let me just say, balancing, troubleshooting, and installing draught beer is closer to rocket science than anyone realizes and I’m sorry to say, but I’ve never seen any info on any home brewers forum that is remotely close to correct. General rule for BEER, NOT SODA OR SDOA WATER when u are say 1500′ or so above sea level, unless you are dealing with a nitrogenated stout or ale is KEEP YOUR PRODUCT BETWEEN 36f & 38f +/- 1 degree IS OK AND USE STRAIGHT CO2 SET AT 12 – 14PSI AND USE 5′ OF 3/16″id HIGH QUALITY BEVERAGE TUBING AND If you’re tapping a fridge directly with a shank and quality faucet, and you don’t have wild beer, it should pour trouble free. Again, every style of beer is different. GENERALLY speaking, nitro stouts and ales have the lowest specific carbonation rates, then ESB ales, ales, lagers. Pilsners, then wheat beers, gueze, and lambics . GENERALLY SPEAKING. The Home Brewer’s Bible, etc can give more specifics. If you run your beer to a remote tower, it must stay refrigerated all the way to the faucet or temp/pressure will get out of balance and the Co2 will bust out and foam will ensue. If using straight Co2, never exceed 16.5psi unless u are above 5000’altitude. Use the correct combination of tubing to stay around 16.5psi and figure on using a minimum of 3′ when figuring your run. If above 38f temp, use more restriction and increase applied pressure up to 17psi only if beer is stored @ 42f max. If it’s 45, use blended gas and u can hit 40psi (depending on co2/n2 ratio) if beer is over 45, you are screwed. Ice it down. The colder the beer, the more readily it will absorb co2 at lower pressures – colder isn’t always better. 12psi should be the lowest you restrict at for most beers. For rise/fall calculations – add .5 every foot of lift & subtract .5 every foot of drop. Measure from the bottom of the keg to faucet spout for most applications, about 1.5psi.. So, say – 5′ of 3/16″ @ 2.2 lbs/ft + 1.5psi from rise = 12.5+/- a little for keg connectors and shank length variation (btw) 1/4″id shank is best. If you do soda, use pure co2 and much higher pressures and much more restriction to keep it carbonated. Sorry, I don’t have time to go into a lengthy discussion on soda theory and practice… Hope this explains and allows fixes for some of your problems. In closing, IF THE APPLIED PRESSURE TO YOUR KEG DOES NOT EXCEED THE NATURAL INTERNAL KEG PRESSURE BY WAY OF TEMPERATURE AND VOLUMES OF CO2 DISOLVED IN YOUR BEER, YOUR BEER WILL GO FLAT. Nature hates imbalance and if u don’t apply enough positive pressure to exceed natural keg pressure, nature will balance that out by out-gassing the disolved co2 from your beer into the headspace of the keg until everything is at a natural equilibrium again. Seriously, ROCKET SCIENCE guys and gals. I could actually go on for several hours or longer about this stuff, but I have to sleep and work, so I bid you goodnight and good brewing. Sorry, actually Brad did mention pressure/temperature relationship, but seemed to be just in passing. In reality, it is universally important to so many things. I occasionally set up a system with beer pumps for a beer purists bar where the pump is the motive force and co2 is set at a pressure to maintain the brewers intended specific carbonation rate for that beer. Fun, fun, fun. My apologies to Brad- I was reacting more to the questions and complaints and bragging of the great unwashed wondering why they were having problems. So many reasons, so little time. Restriction, related to pressure, related to temperature, and the condition ofriends the tapping equipment, and oh yeah, is it a bad/spoiled keg and was it even brewed and/carbonated correctly. Was it force carbonated or natural. What, I’m rusty 1 cup of corn sugar if you bottle and only 1/3 cup if you keg. Details, there the Devil lays. Hey Woody – I have had a similar experience. I switched to longer serving lines and my foaming issues are gone. These calculations sound great, but don’t seem to match my real-world experience. I am running 10 ft 3/16 lines at 10PSI right now on picnic taps as my kegerator refrigeration broke and I had no way to serve. No foam, and no problems with beer reaching the glass. I am going to try 4 ft of 3/16 on my current keezer build with perlick 630ss faucets. I will report back when I have the project complete and let you know how it pours. I wonder if you could have a problem with your ball lock (assuming ball lock) not seating/operating correctly. Check the gaskets and poppits in your posts. They are cheap to replace. In the past I have had CO2 mixing into the beer at the post (I believe) making for crazy foam when I poured. I replaced the gaskets and the shameful waste stopped. I know that if I had 2 ft of 3/16 at 10 PSI the beer would come blasting out of there and would be all foam. Try a 10 ft. length and see what happens. Hi, glad the discussions are still very much alive, I have a few questions for when using an in-line chiller (such as the Cornelius maxi range) with python cooling all the way to the faucet. 1. Is the length of the chilling coil included in the calculation? 2. Where the chiller is 3/8″ ID and the rest of the beer line is 3/16″, how do you calculated this? 3. Where is it best to have the the chiller, immediately after the beer leaves the keg? I agree with a number of posters here. The equation/math says I shouldn’t need more than 4.5 ft. I’m up to 7 ft. of 3/16″ line now and it still foams excessively at 12 psi. I guess I’ll take the opposite approach that I have been taking. That is, install 12 ft of 3/16 in line and start cutting it until the system is balanced. Its better to cut from one long line than constantly buying more line a foot at a time. 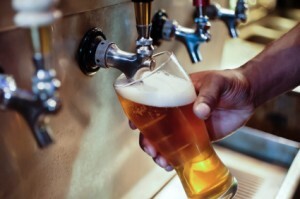 I have read and understand the requirements associated with balancing a draft beer system. Here is my question: I am currently carbonating at 21 psi at 66 degrees. When I purchased my draft system, I ordered 7 foot long beer hoses, not knowing any better. I plan to store my beer at 38 degrees, and in order to have 0 to 1 PSI at the tap, I will have to pump 21 PSI into the keg. I plan to store my beer at 38 degrees once the carbonation process is complete. Doing so will increase my volume of CO2 considerably. If I purge the keg and reduce the current volume of CO2 in the keg, once the carbonation process is complete, and then use the 21 PSI to pump the beer through the 7 foot lines, will I over carbonate the beer in the keg? I am trying to avoid having to reduce the length of the beer line, but it looks like I may have to cut it. I am also setting up a nitrogen system, do the same PSI rules apply? I am looking for a factor for 5/16″ PVC Bevlex tubing. Pat’s “poly” numbers I believe are confused – they go down and then up as the diameter increases. Does anyone have a good number? Or for that matter, it would be great to hear if someone has practical experience with 5/16″ beer lines. It isn’t what I ordered but I am trying to make the best of the situation. I’m in the same boat I’ve recently built a kegarator and started of with roughly 4ft beer lines and got froth every pour. I went to nearly double and still foam every time. My serving pressure is at 10 psi and my kegs I would say maybe a foot and a half from my taps. Also having trouble carbing it I have no leaks either. Please help as I’m over wasting good beer. in the equation and example above dealing with height differences, L = (keg_pressure – 1 – (Height/2)) / Resistance, shouldn’t the Height/2 be added to account for losing the psi where the tap is above the keg as in the example? L should equal (12-1+(2/2))/3 = 4 ft. An increase over the 3.66 ft needed for no elevation difference. I’m building a portable kegerator with 2.5 gallon kegs inside a wheeled cooler. I was wondering would you recommend a 3/16 or 5/16″ beer line, and how long? The shank will be drilled through the front of the cooler, so it won’t have any elevation. Joe, imagine your tap was 10 feet above the keg, (12-1+(10/2))/3 = 5.33 feet. It would not make sense to be adding more length (resistance) to balance your system the further the beer has to climb. You need less resistance to compensate for the pressure loss due to elevation. Russell, definitely you want to use the 3/16″ ID tubing. This article tells you that you would need longer beer lines to balance your system if your used the larger ID tubing. Most people recommend 5 feet of 3/16 tubing. Set your temp to 36 degF – 38 degF and your regulator to 8 – 12 psi. I shamelessly took this formula and made an online version of it at http://homebrewcalc.com/#LineBalancing that also support metric units (bars and meters). I listen to your podcast regularly, I am really enjoying the content. Again with this thread you have taught me something new, your simple explanation and math is really appreciated. This is a very very simplified version of calculating system head loss in fluid systems which they use to find out what pump they should use in mechanical engineering. basically they calculate this is two sections static & dynamic head. Does this equation only apply to the initial pressurizing of the keg? I just received my first kegerator and tapped my first 1/4 keg (other than college years) of Miller Lite. Everywhere I’ve read shows the PSI should be between 10 and 14 to get the right pour. At 8 PSI, I get 3/4 head in a cold mug, at 3 PSI I get regular pour except VERY slow. My fridge is 36 degrees, the beer is 37. My Kegerator is an Igloo, so am assuming it’s 3/16″ vinyl tubing, 5 feet long. I am struggling with this and need any help I can get. I believe 3 PSI is too low to maintain freshness for any length of time. I had 4’ 3/16 lines with 10psi on my keg and was foaming like heck. I switched to 10’ line and get a great pour every time. I second your response. Any chance that a calculation template for draft line balancing will make it into a future version of beersmith? This would be super helpful, especially if it included an altitude correction. I could use this on my home system, but also for when traveling with my jockey box. Thanks, can’t wait for v3 soon!